Spokane – On August 16, the Washington State Court of Appeals issued the third legal decision in favor of Spokane River advocates seeking to stop more PCBs from being added to the Spokane River from the Spokane County’s wastewater treatment facility. Three courts have now ruled that the Department of Ecology (“Ecology”) failed to do what the law requires: analyze whether the County’s discharge of PCBs has potential to violate state water quality standards, and if so, then impose appropriate limits to prevent such violations. The Appeals Court left intact an earlier ruling that the Spokane River Toxics Task Force is not an adequate or legal substitute for pollution control limits. Sierra Club and the Center for Environmental Law & Policy (CELP) filed the lawsuit against Ecology in 2011, and praised the Court’s ruling. “The Court decision is another important step to clean up PCBs polluting the Spokane River,” said Rachael Paschal Osborn, with Sierra Club and CELP. In rejecting the appeal by Ecology and Spokane County, the Appeals Court stands with earlier decisions that, because the 2011 permit lacks any limit on PCB discharges, it violates the Clean Water Act, and that other terms of the permit are vague and unenforceable. The Board remanded the permit back to Ecology to do over. The Spokane River is among Washington State’s most contaminated river for PCBs. Exposure to PCBs through ingestion of Spokane River fish represents a public health hazard. 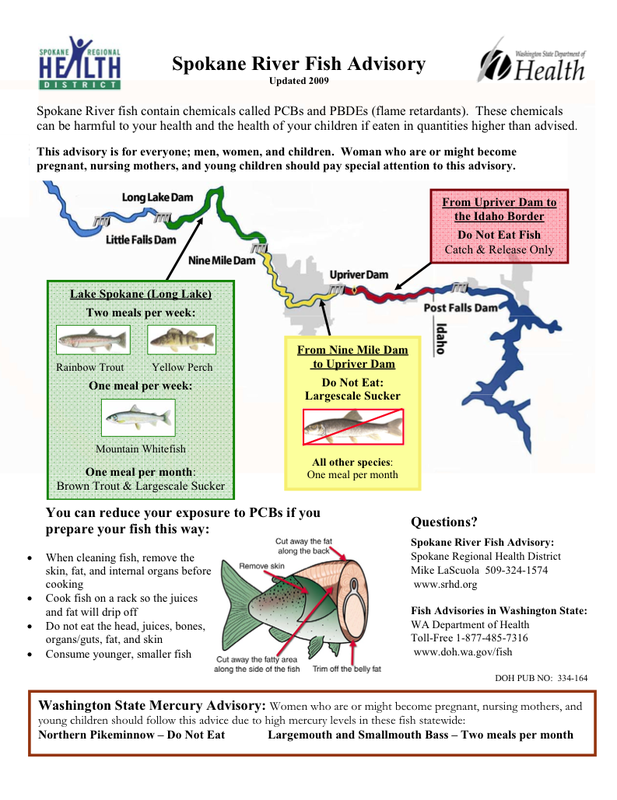 In 2008, the Washington State Department of Health issued fish consumption advisories, recommending limited or no consumption of fish from Lake Roosevelt and the Spokane River. In 2011, Sierra Club’s Upper Columbia River Group and CELP filed this suit and a companion lawsuit in federal court to compel Washington State and the U.S. Environmental Protection Agency to uphold water quality laws for the Spokane River. The Spokane Tribe intervened in support of the federal lawsuit. In that case, a Seattle federal judge ruled that EPA was wrong not to require the Washington State to prepare a clean-up plan for Spokane River PCBs. Sierra Club and CELP are represented by attorney Richard Smith of Smith & Lowney PLLC. The state’s pollution court, the Pollution Control Hearings Board (PCHB) ruled that the Toxics Management Program in Ecology’s 2011 permit “is “confusing, vague, and lacks definition of key terms. More importantly, it lacks deadlines by which Spokane County is to undertake and/or complete actions to reduce PCBs in influent to the facility. It lacks mandatory language requiring Spokane County to actually undertake necessary actions to achieve reductions in PCBs in both influent and effluent. . . . [R]ather than requiring Spokane County to meet water quality standards, the [Toxics Management Program] only asks that the County take steps so that ‘in time the effluent does not contribute to PCBs in the Spokane River exceeding applicable water quality standards.’ . . . The Permit must require Spokane County to comply with water quality standards . . . .”” (Paragraph 13, p 23-24) This requirement will need to include compliance with the Spokane Tribe’s downstream water quality standards that were adopted by the Tribe and approved by the U.S. Environmental Protection Agency in 2003.